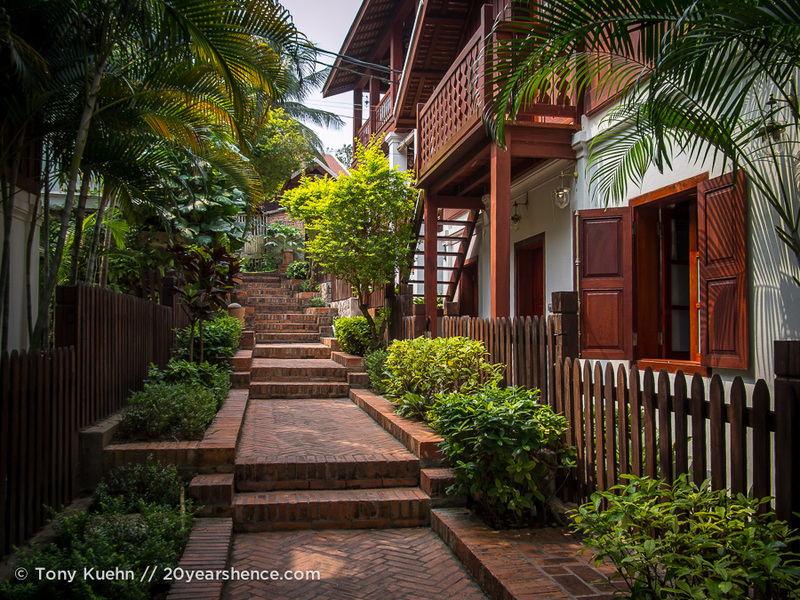 For most travelers, Luang Prabang is the highlight of their visit to Laos. Declared a UNESCO heritage site in 1995, the town is known for its charming colonial streets, dazzling wats, early morning alms ceremonies, a fabulous night market, and an impeccable dining scene. Take a languid ride down the Mekong or hop in a tuk tuk to explore the surrounding environs, and you will encounter some of the best landscape in the country, resplendent with mind-bogglingly beautiful waterfalls and ancient caves crammed with armies of Buddha statues. 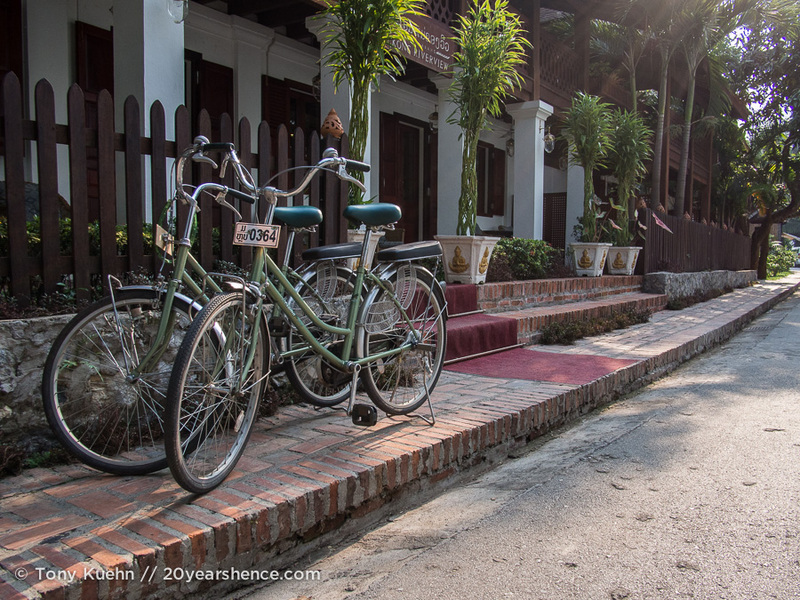 We found, the Mekong Riverview Hotel. First opening its doors at the tail end of 2007, The Mekong Riverview is the ultimate destination for travelers who want an elegant, upscale base while in Luang Prabang. 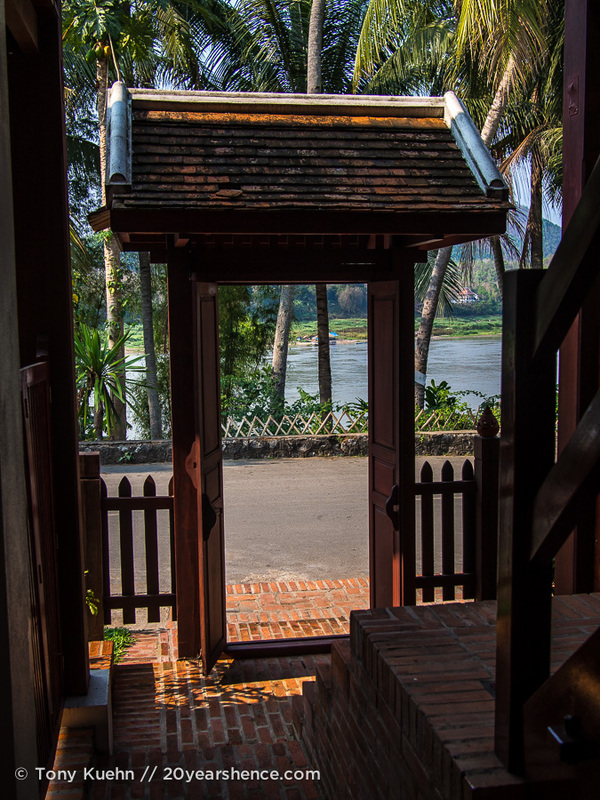 Perched next to one of the country’s most beautiful and important temples, Wat Xieng Thong, the Mekong Riverview boasts an incredible location—positioned at the tip of the old town at the confluence of the Nam Khan and Mekong Rivers, the hotel gifts its guests with an incredible view. 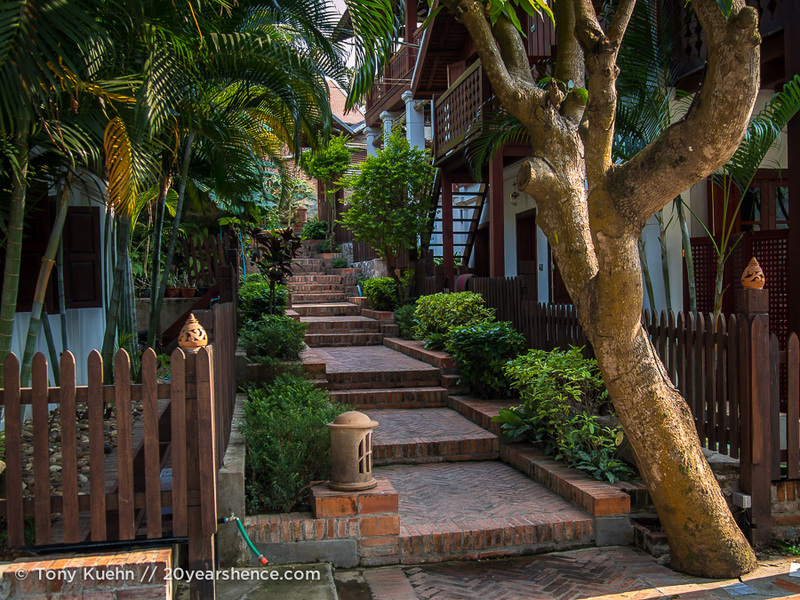 Additionally, it offers a serene setting at which to relax and unwind, but also a convenient position to explore the rest of the town should you be so inclined (which, we clearly were not). 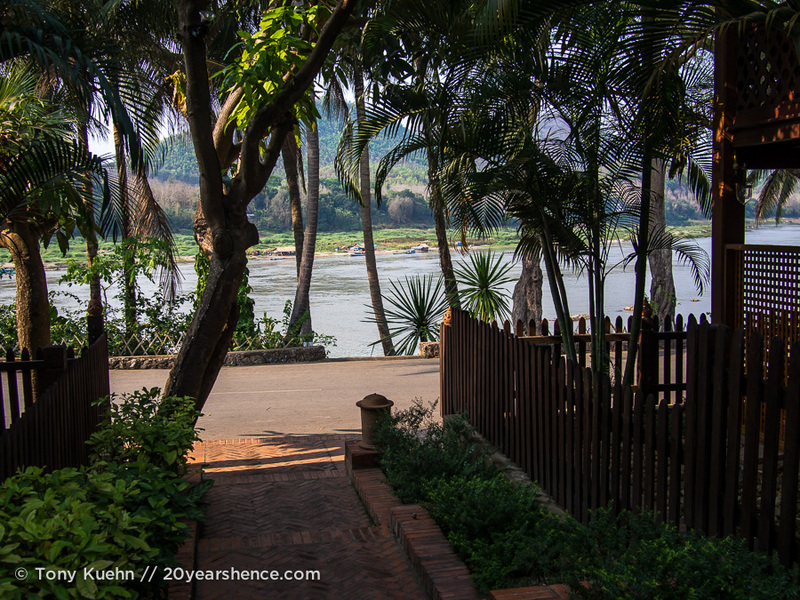 From the minute we stepped through the doors of the Mekong Riverview, we knew it was going to be one of the nicest places we had ever stayed, not just on this trip, but during any of our travels (including our honeymoon!). While staff whisked our bags to our room, we were greeted by Bounpheng, the manager, and two glasses of fresh-squeezed orange juice. 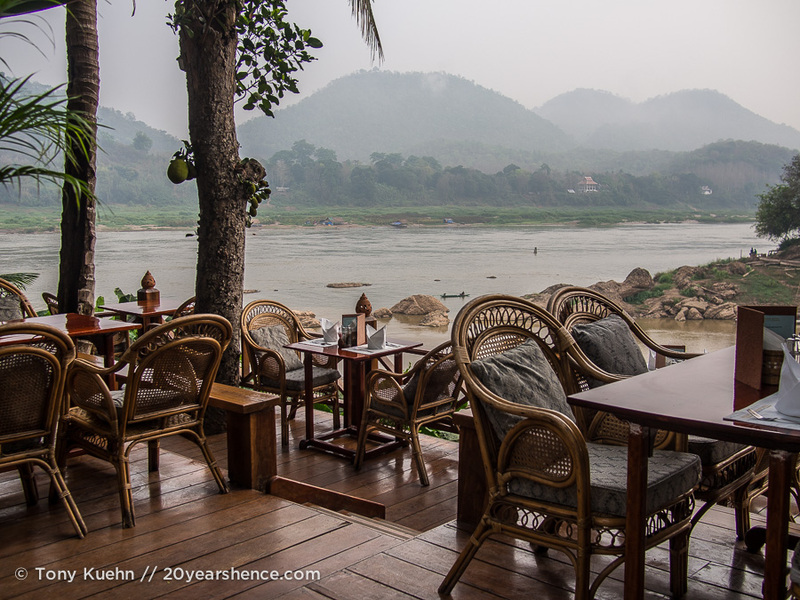 Bounpheng sat down with us and highlighted Luang Prabang’s major attractions on a detailed map that the hotel had supplemented with helpful information such as operating hours for the night market, the best bookstore in town, and where to find the best traditional Lao food. Within 5 minutes of our arrival, we felt more informed and more prepared to explore the city than we had anywhere on our travels in recent memory. And then we were ushered into our room and we knew that all of Bounpheng’s build-up had been wasted on us. Because after a quick poke around the room and, even more dangerously, bouncing our bottoms on our bed to test how soft the mattress was, we knew we weren’t going to be doing very much exploring at all. Our Superior room came with a private patio complete with lounge chairs that were optimally positioned for gazing out on the Mekong, a big desk perfect for blog-writing, a mini-bar stocked with complimentary bottles of water and free soft drinks (and not the cheapo off-brand stuff, but proper bottles of Sprite, Coke, Fanta and even Coke Zero, which is nigh impossible to find in this part of the world! 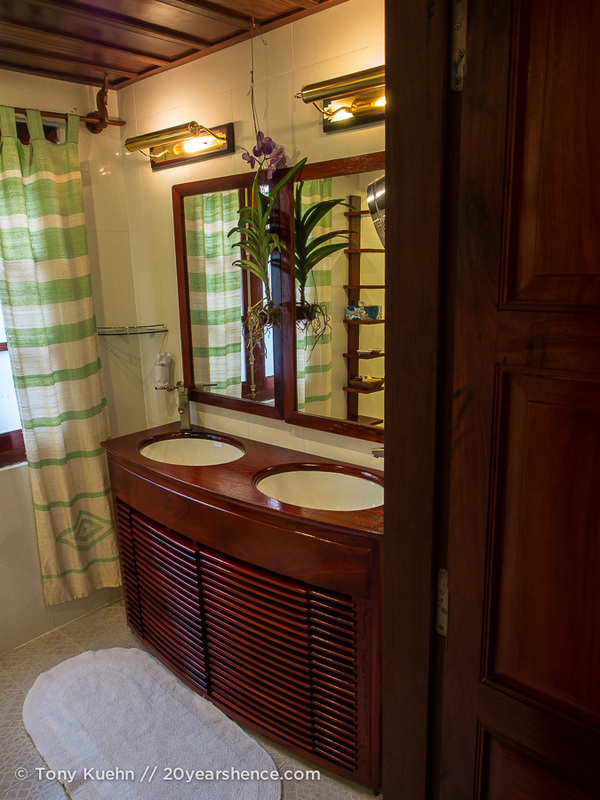 ), and one of the nicest bathrooms we had set foot in while in Asia. To be perfectly honest, the bathroom alone was nicer than a lot of the rooms we have bunked down in over the past 20 months! The space was large and bright, and the standing shower (complete with rainfall showerhead) was nicely separated from the rest of the room, meaning no pesky pooling of water all over the place, which continues to be one of my biggest pet peeves about bathing in this part of the world. The toilet was conveniently located in its own separate room (truly a water closet! 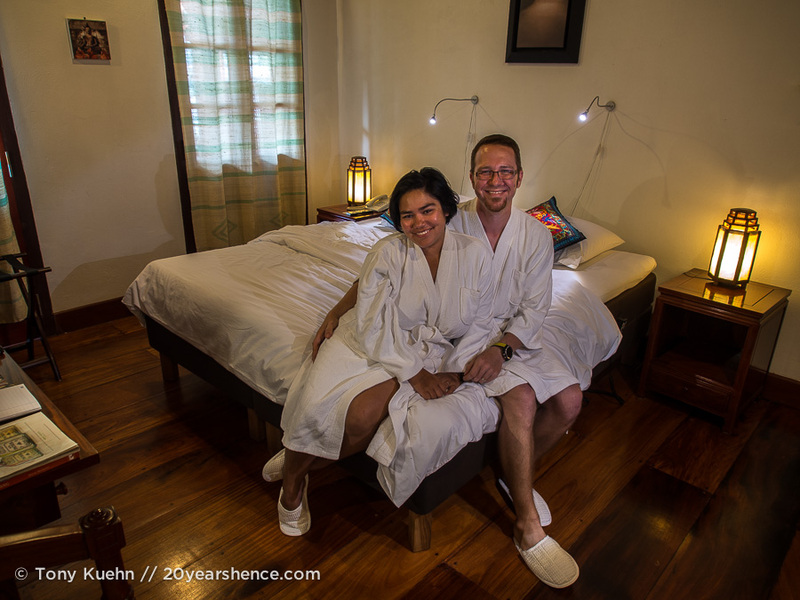 ), which is ideal for a traveling couple. If we had been told we were simply relegated to the hygiene quarters of the room, we would have actually been quite happy! But the real deal-sealer and the thing that would prove to be the death knell to our touring itinerary for the next 3 days was the bed. It is with great pain that we have finally acknowledged that soft beds & Asia aren’t compatible; having actually bunked down on planks of wood wrapped in linen being passed off as a mattress (thanks Annapurna circuit! ), this bed was a revelation. Imported from Sweden, this baby was an example of Swedish engineering at its finest. As I sank down onto it, the contours of its memory foam perfectly cradling my body, I burst into hysterical laughter. Intrigued by my response, Tony joined me, only to groan that it was “like sinking into a marshmallow!” As if the perfect cloud-quality of our bed weren’t enough of an incentive to never ever leave its clutches, it also came with fancy remotes so that you could elevate and contort the mattress so that you could sit upright in bed without ever breaking contact with any part of the mattress. So much for that beautiful desk—I knew I would be doing all of my work from this plush “office” for the remainder of our stay. The hotel also tempted us out of bed every morning with one of the best breakfasts we have had in the past two years. 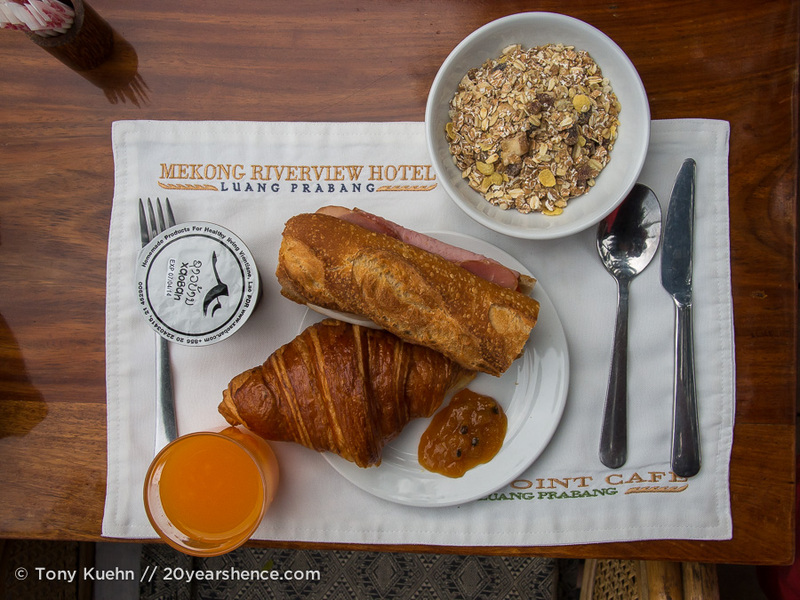 Part of what makes a visit to Luang Prabang so delightful are the colonial touches, whether in the storefronts and architecture, or the incredible pastries and baked goods… the latter of which were featured prominently in the Mekong Riverview’s breakfast offerings. 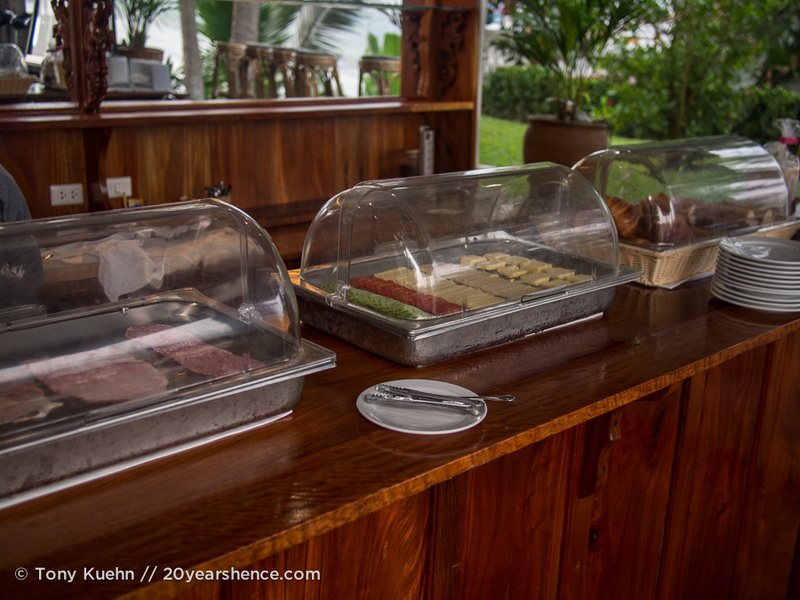 We would start each day with some selections from the breakfast buffet. Perfectly flaky and crispy croissants were piled beside a basket of whole-grain baguettes that had the perfect amount of crunch and chew to them. To accompany them, platters of fresh cold cuts— including smoked ham and silky prosciutto—along with soft pats of butter, dollops of aromatic grainy mustard, and slices of sharp cheese awaited those whose breakfast palates are European in profile. If these items suggest lunch rather than breakfast to you, there were also a dizzying assortment of local jams, from standard options like strawberry to more exotic offerings such as mango, mulberry, or mango passionfruit (our personal favorite). Steaming samovars of coffee and hot water for tea were always standing by, as well as bottles of chilled water and jugs of fresh orange juice. For those (fools) looking for a little less decadence, cold cereals and fresh fruit yogurts were also available, and the local yogurt was so thick and creamy it seemed more akin to custard than curd. To supplement the buffet, several hot à la carte menu items are offered, from eggs cooked virtually any way you can imagine them (and executed perfectly, whether scrambled, fried, or poached) to sausage, proper American/streaky bacon, and ham. 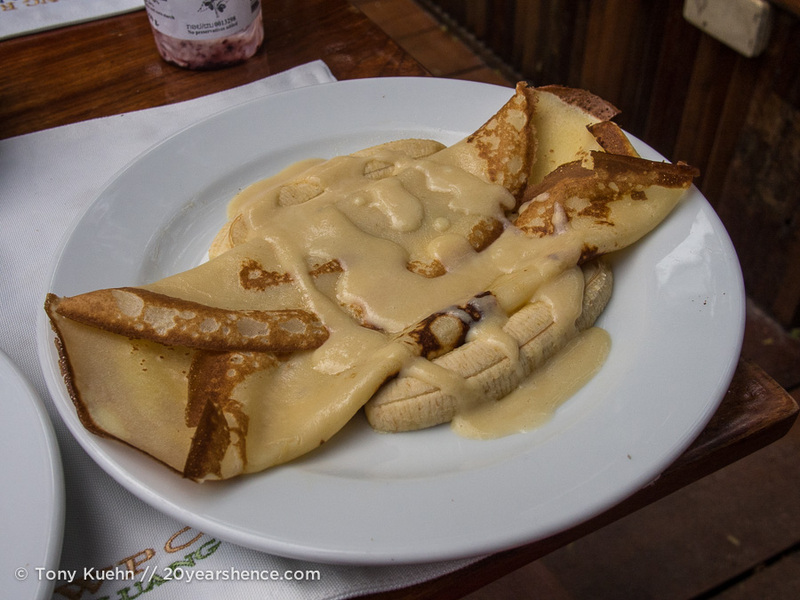 They also offer some sweet options, including three different types of “pancakes” (really, crêpes), our favorite of which was topped with banana and vanilla sauce. 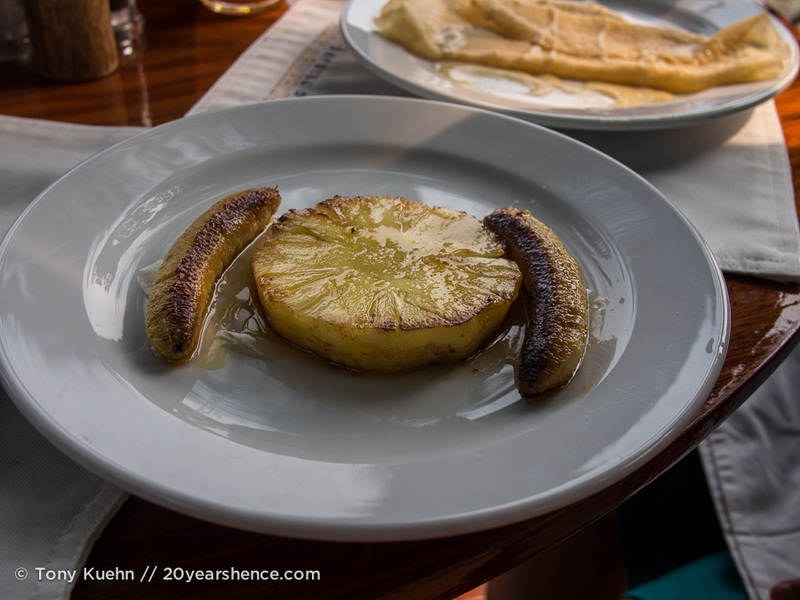 If you have a sweet tooth and/or fancy dessert for breakfast, be sure to order the special dish (denoted on the menu as such) in which banana & pineapple are cooked in honey and grilled; this dish was incredibly rich and reminded me a bit of Bananas Foster. Tony & I would often split an order and add them as extra toppings for our pancakes, which was definitely not a mistake. The hotel also offers three Asian breakfast menu options of the fried rice, fried noodles, noodle soup variety. These need to be ordered at least 40 minutes in advance or preferably the evening before, along with your dining time, so they can be ready for you as soon as you sit down. For the sake of research, I intended to try at least one of them so I could report back on how they were, but honestly, the continental options were so good and I was so committed to eating my weight in buttery croissants and cured meats that I never got around to it. 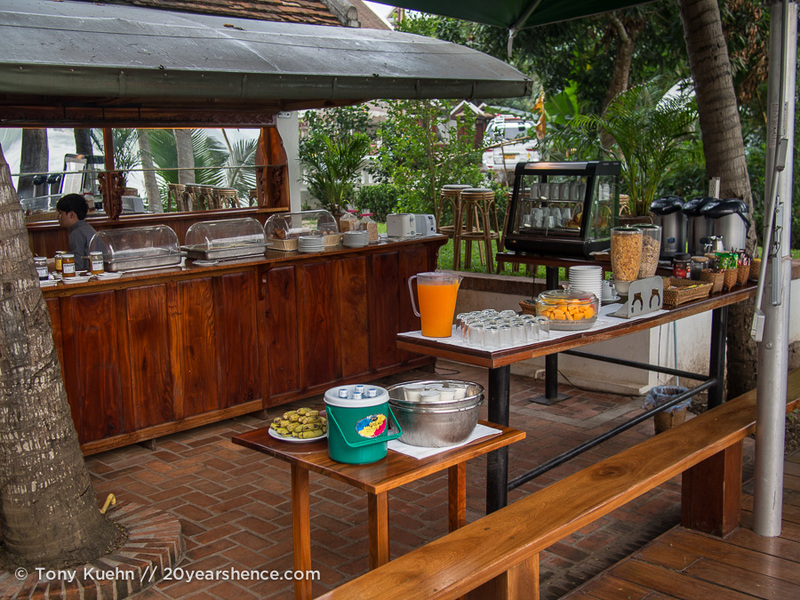 So, unfortunately I can’t vouch for the Asian breakfast options, but if they are anything like the western ones, they will be some of the tastiest things you’ll eat while in Luang Prabang (no small feat, because it’s a great food city!). Completely al fresco, the hotel restaurant, the Viewpoint Café, is perched right on the edge of a park and has stunning views onto the two rivers that meet down below. It was the perfect venue to start our days, and once we had eaten our fill, we loved relaxing with cups of tea and watching the lazy life of the river slowly proceed. The restaurant also serves lunch & dinner, and in the evening, the setting is especially intimate and romantic as the blaze of lanterns cut through the darkness; the menu—serving a selection of Lao (with a particular emphasis on regional specialties) and European dishes—is a bit spendy with dishes starting around $6US, but this is competitively priced for Luang Prabang, especially considering the location and atmosphere. One of the things that we try very hard to do when traveling is to make sure as much of our money goes into the local economy as possible; with so many perfectly acceptable (and sometimes even extremely good) family-run guesthouses in Asia, we often find it difficult justifying pricier stays at foreign-run/foreign-owned resorts. Although, the owner of the Mekong Riverview is Swedish, we were very pleased to read about all of the ways in which the hotel actually gives back to the local economy—not just through payment of taxes, but also through sponsoring local charities and organizations focused on the betterment of the city (such as funding most of the street lamps in the old quarter and paying for the construction of the small public park next to the restaurant)—and its employees. Not only are many of the employees given room and board, but for younger members of the staff, schedules and working hours are structured around their schooling and higher education. Although the hotel is clearly a top-notch establishment, it still has an intimate family feel to it, and we got the sense that there was great camaraderie and mutual respect amongst the employees. Also, I have to say that we found the information binder provided in our room to be really enlightening regarding tourism in Laos and why things cost as much as they do. Given that Laos is a very poor country, it was a surprise to find that eating local food in local restaurants could still cost $3 or $4 per dish, sometimes double or triple what we paid in wealthier countries like Vietnam and Thailand. It was only at the Mekong Riverview that we learned that this is because the poorest communities in Laos are self-sustaining, only producing enough to keep themselves going; the infrastructure in Laos is so poor that pretty much all restaurants have to import their ingredients from Thailand or Vietnam, which raises prices. After reading this, the prices we saw throughout the country made a lot more sense, and we could better understand why a simple larb salad might cost half as much as our evening’s accommodation or was on par with western options like pizza or pasta, even in a destination fairly far from the tourist trail. 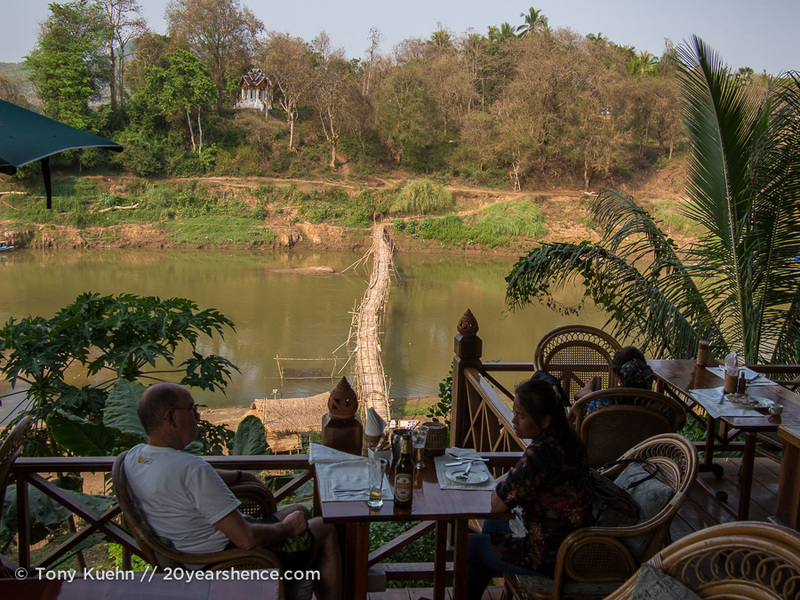 Both of us really appreciated how much the Mekong Riverview wants to not just entertain and pamper its guests, but really help them understand and appreciate Luang Prabang and Laos in general; too often people stay in places like this only to completely miss out on the country they are visiting. 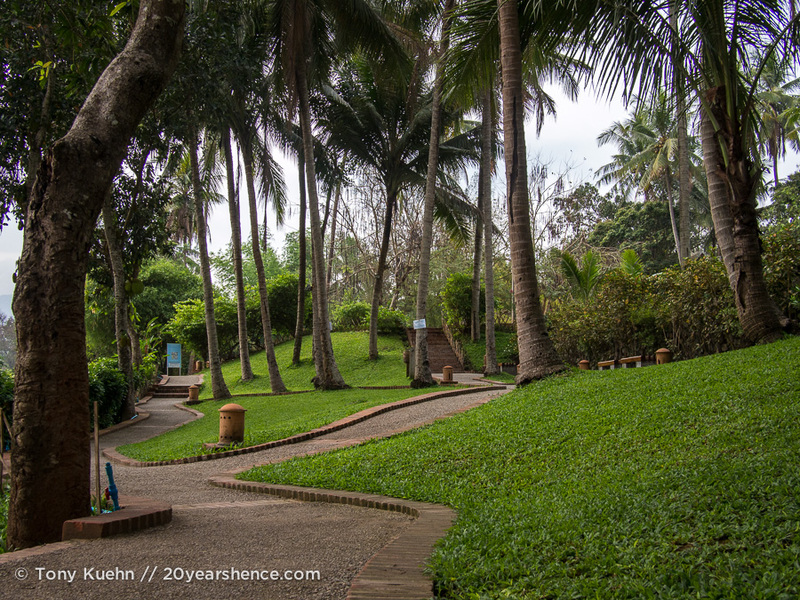 Because the Mekong Riverview is located in the UNESCO protected portion of the city, there is no swimming pool on the property. Obviously there’s nothing that can be done about this and the staff are more than happy to take you to a public pool in the golf cart if you want, but we were surprised as we expected a property of this caliber to have a pool. The rooms on the ground floor have front patios, but these are just a few feet from the main riverside road… meaning that when you’re lounging around in your robe reading the paper, you’re doing so in full view of all the folks who are out sightseeing. It’s nice having that outdoor space, but we didn’t always feel 100% comfortable out there during busy times of the day. More expensive rooms are on higher floors, so this would not be an issue. We loved our shower and bathroom, but we did feel that the hot water ran out a little bit faster than we expected (often began to cool after about 5 minutes into a shower). Also, we expected—and were hoping—to have a bathtub, not simply a standing shower, but tubs only feature in the more expensive rooms. Free WiFi is available throughout the hotel property and we were able to access it from our room. However, we found that the internet could be quite unreliable at times, although it was certainly sufficient for checking emails and light web browsing. We are mindful of the fact that we were in Laos where internet is often dicey, and this might not be something the property can control; we didn’t try to access WiFi elsewhere in Luang Prabang so we can’t really specify whether this is simply something you have to accept when visiting the city, however, connectivity was certainly worse here compared to Vientiane. Obviously none of these are deal breakers, and indeed, two of them are just part and parcel of traveling in Laos. 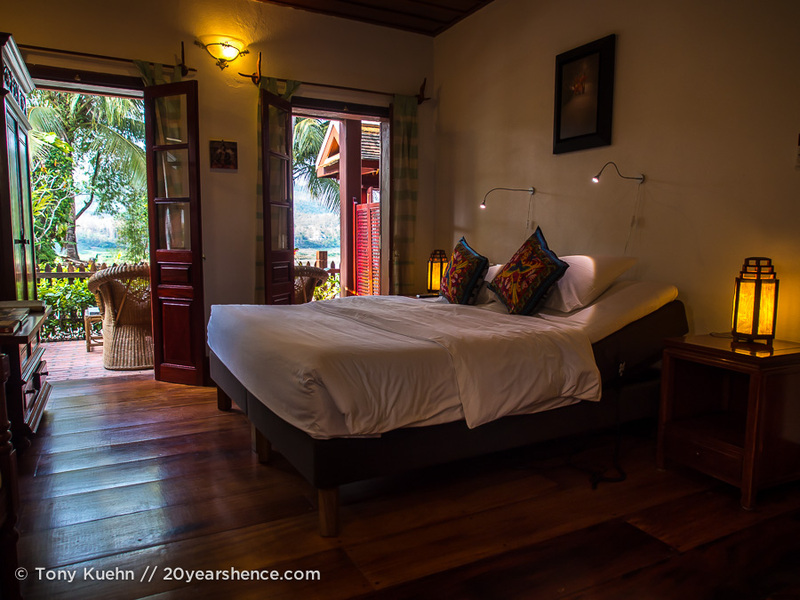 If we had any other qualm about staying at the Mekong Riverview Hotel, it is simply that our room (and that bed! Seriously…) was so nice, that it really did make us not want to leave to explore the city. 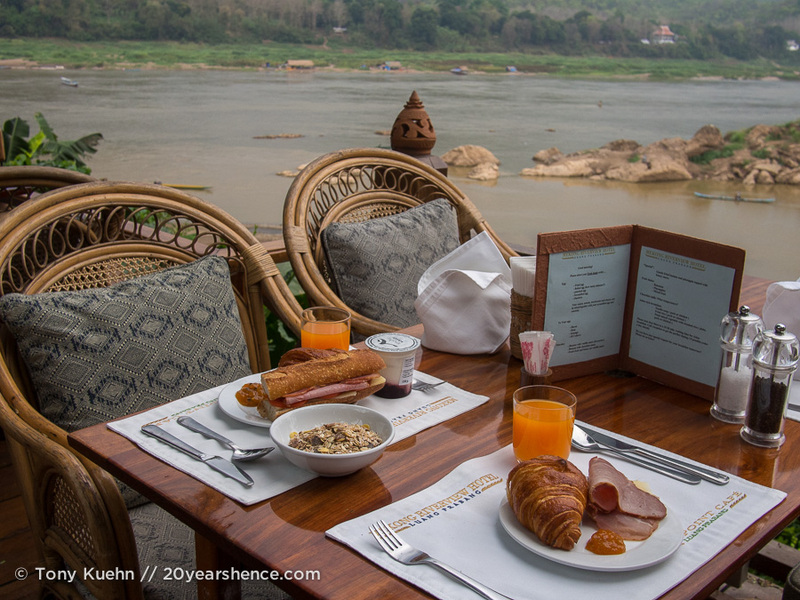 Whether this is truly a curse or a blessing probably depends on your own travel priorities—for us, our stay at the Mekong Riverview was a wonderful reprieve from the rather basic lodging we long-term travelers often settle for. 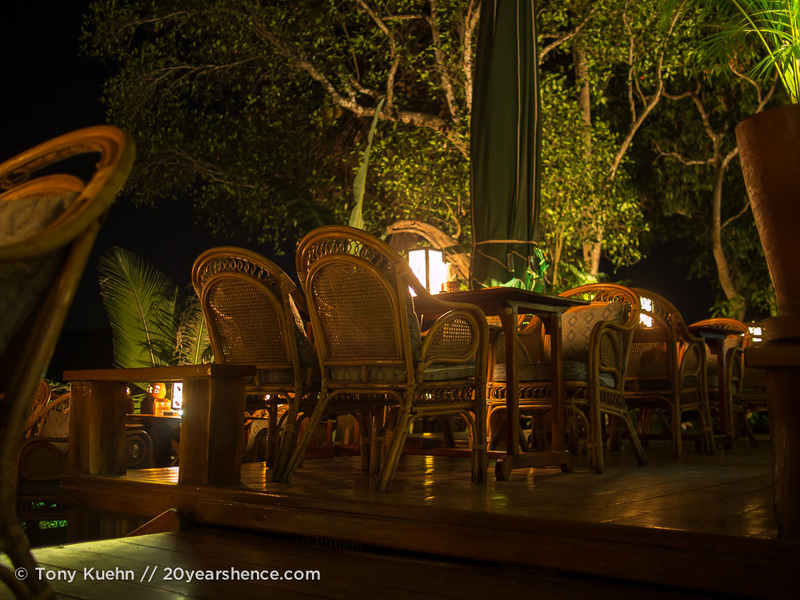 We don’t often have the opportunity to stay in places that are more than a quiet space to rest our heads at the end of the night rather than an attraction in and of themselves. 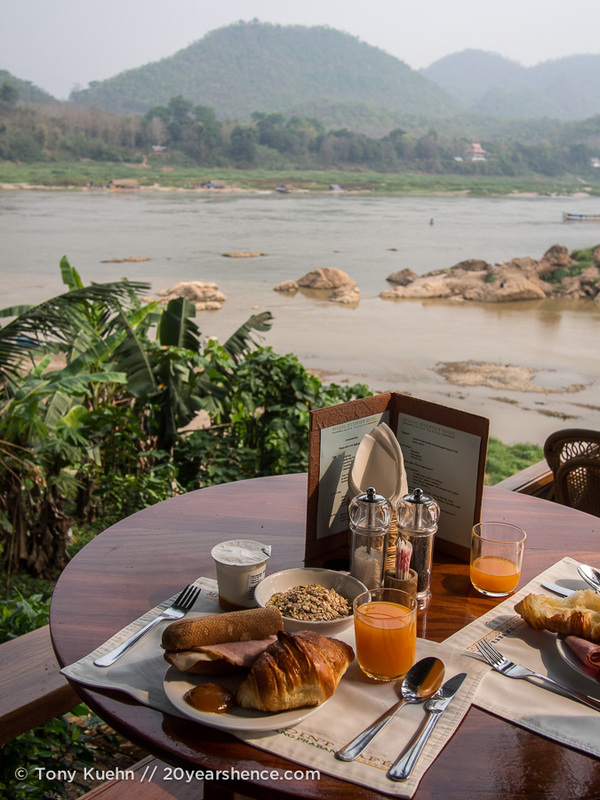 Although a pricey indulgence, Mekong Riverview doesn’t just get the big things right, but pays attention to the little details that all combine to make for an excellent stay. Things like the complimentary mini bar, free shuttle around town (and complimentary airport pickup and drop-off), free cake (!) in the main reception building in the afternoons along with free-flow tea & coffee, in combination with the stunning design and excellent location make this one the most memorable and truly relaxing places we have enjoyed during our trip. Tell Us: What’s the fanciest place you’ve ever stayed on your travels? Have you ever experienced the glory of sleeping on a bed that feels like a marshmallow? What would you devour at the Mekong Riverview’s decadent breakfast buffet? I always appreciate at least a little piece of luxury when I travel, even if it’s for just part of the trip. 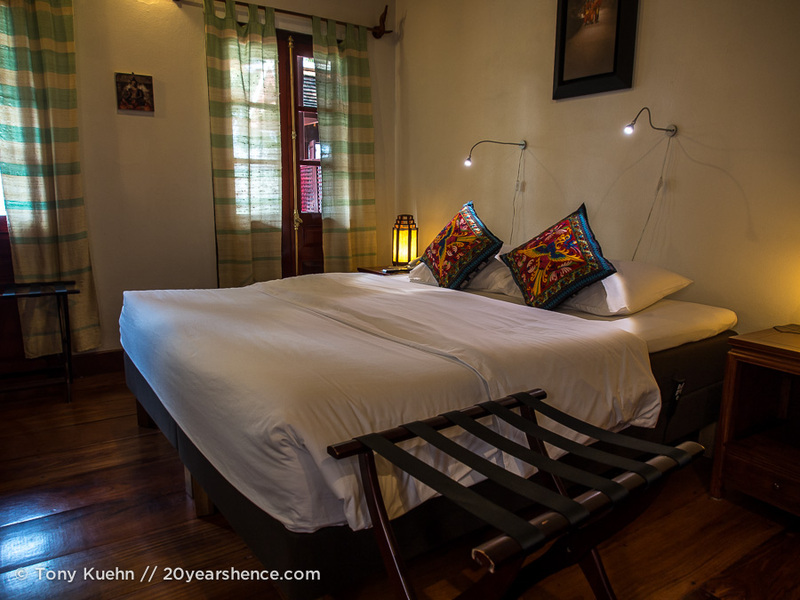 Revitalizes you and makes it okay to stay in a hostel at your next stop! The hotel looks really pretty and that location is to die for! We’re generally pretty bad about pampering ourselves when it comes to lodging because we generally think about all the other ways we could spend that money/how many more days we could travel, etc., But sometimes it really is important to give yourself a break from the nondescript and slightly suspect places and get a couple of nights of good sleep. If it’s on a marshmallow, even better! Oh wow, that’s absolutely gorgeous! That sitting area with the view of the river – stunning! I could spend all day there! Looks like you had a great time! We had an awesome time and this was the perfect place to unwind. After being on the go and pushing ourselves pretty hard travel-schedule wise for the previous 2.5 weeks, it was really nice to go somewhere and do pretty much nothing for a few days! 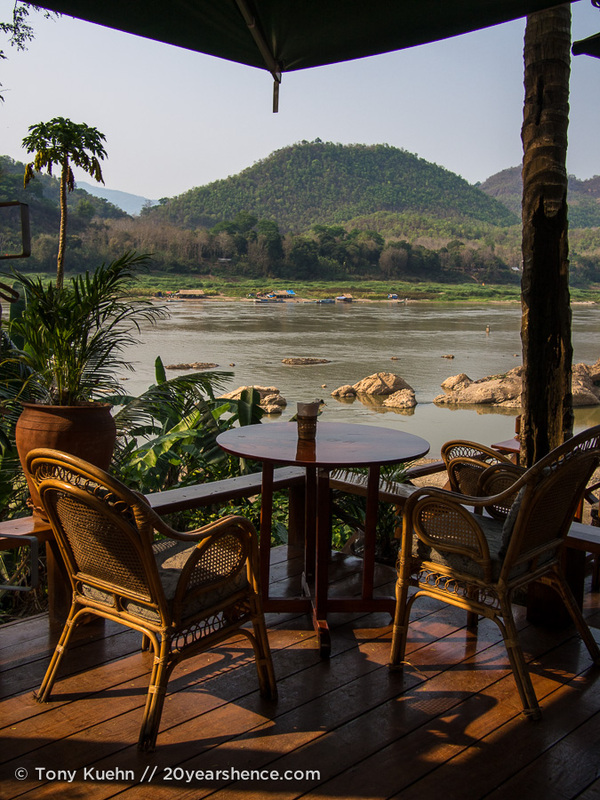 This place looks incredibly nice guys and it’s right by the Mekong, which means stunning views! 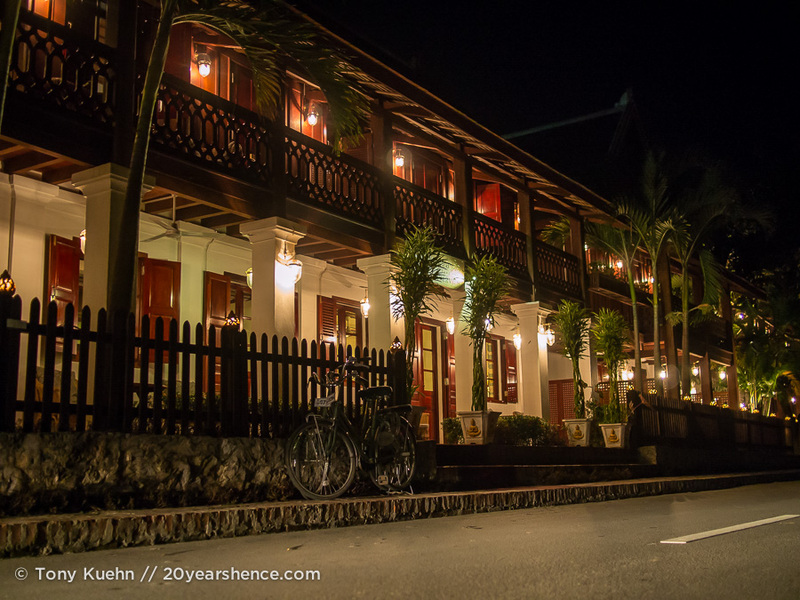 I remember when we were in Luang Prabang walking by this hotel and thinking how nice it would have been inside, now I know and I don’t need to use my imagination anymore. Franca recently posted..Is Frankfurt Worth Forgetting? It was a great location, although we hardly took advantage of that because we were so determined to spend as much time in bed as possible! 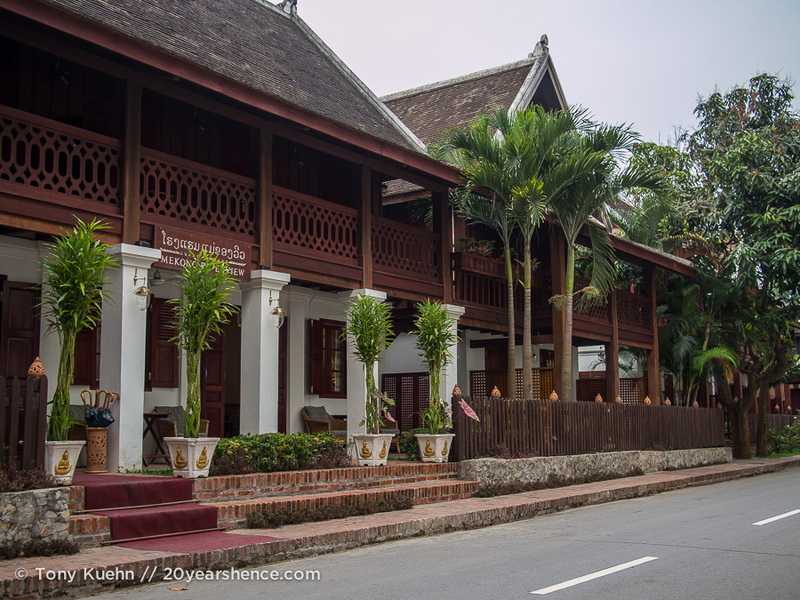 On our few strolls around town, however, we did note that there certainly is no shortage of lovely hotels in Luang Prabang… but I still think this one might be the nicest! Steph, Isn’t it nice to pamper yourself every once in awhile. What a gorgeous little retreat! Um, I just ate a huge salad but after seeing the photo of crepes with vanilla sauce I am officially hungry again! YUM! What a nice treat to stay at a fancy pants (or should I say fancy robes) hotel. The nicest place I’ve ever stayed was the Win Hotel in Las Vegas for a work-related conference. But my opinion may be skewed because I wasn’t paying for it. 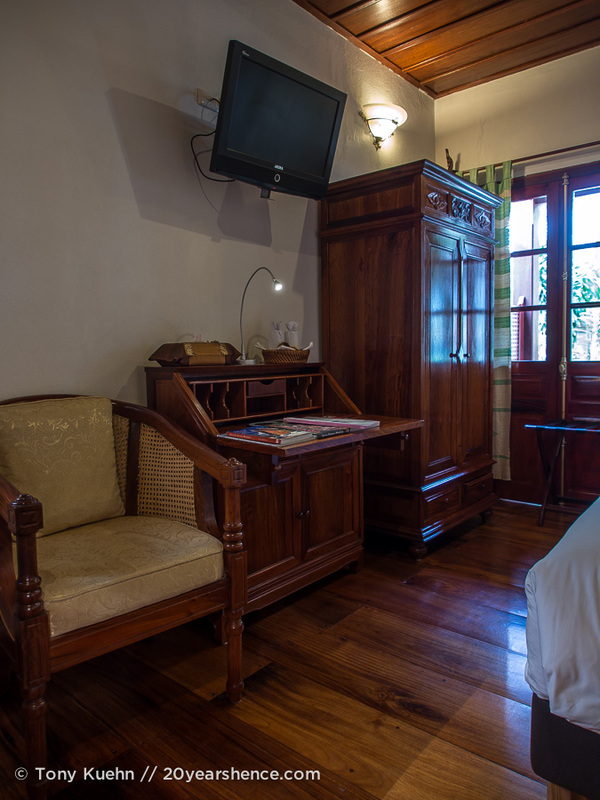 On this trip we haven’t splurged much, but after a week in this crap-tastic hostel in Mendoza, Argentina, we’re contemplating something fancy when we get to Salta on Monday. Crepes beat salad every single time in the rock, paper, scissors of food! You guys are so cute! I laughed so hard at that photo of you guys on the bed. You have had a tiring past few weeks; I’m glad you were able to enjoy a rest. We were kind of similiar in Siem Reap. I pushed myself to go out during the day, but Michael only went out in the afternoons because he enjoyed his sleep ins so much. And we only went out once at night, because the room was fancy, so it was just sooooo nice to hang out on the couch eating room service and watching TV. Can’t wait to hear some more detail about Sri Lanka! 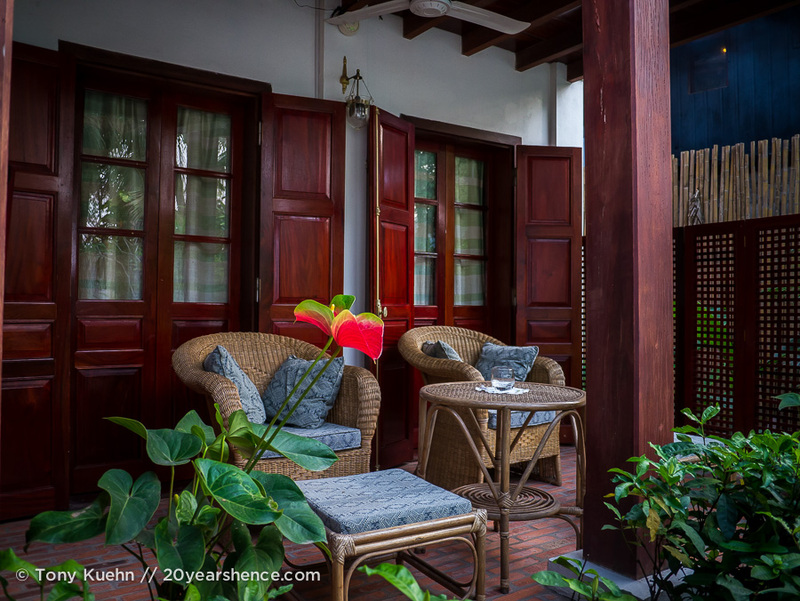 We also stayed at a nicer hotel when we were in Siem Reap because we knew that we’d want somewhere to laze around in the afternoons after busy mornings temple hopping. Thankfully we didn’t stay somewhere quite this nice, otherwise we would have undoubtedly missed out on Angkor and that would have been a real shame! This looks amazing! That bed, those breakfasts, I’m jealous. Everyone deserves a bit of luxury now and again. Yes, even long-term travelers need to remember what a proper vacation tastes like every now and then! From the sounds of it on your end, it seems like you guys have been having a rough go of it lodging-wise but decided to finally splurge a bit to great success! This place looks absolutely incredible – that view is gorgeous! I don’t blame you for not wanting to leave the hotel – I could sit and stare at that view for hours! The only thing that could tempt us from our beautiful bed there was that view! Because man that bed was incredible… I miss it every single day! Hello-did it bother you that there was no pool at the Mekong Riverview HotelWe will be there next week–juz wondering if you found a pool somewhere! It didn’t bother us that there was no pool at the Mekong Riverview hotel. We didn’t find LP to be especially hot during our visit (and it rained quite a lot), so we didn’t miss the pool. 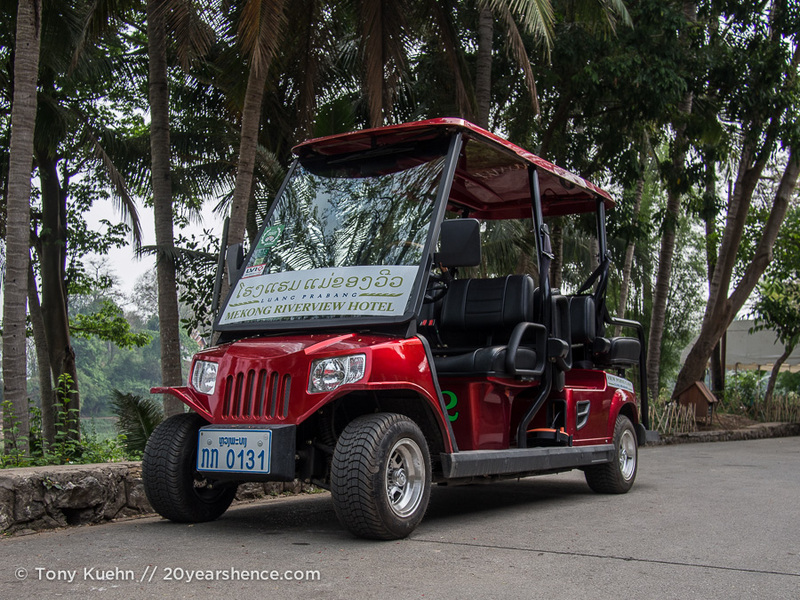 I believe that if you really want to visit a pool, the staff can suggest a few and even drive you to one of them in the golf cart.